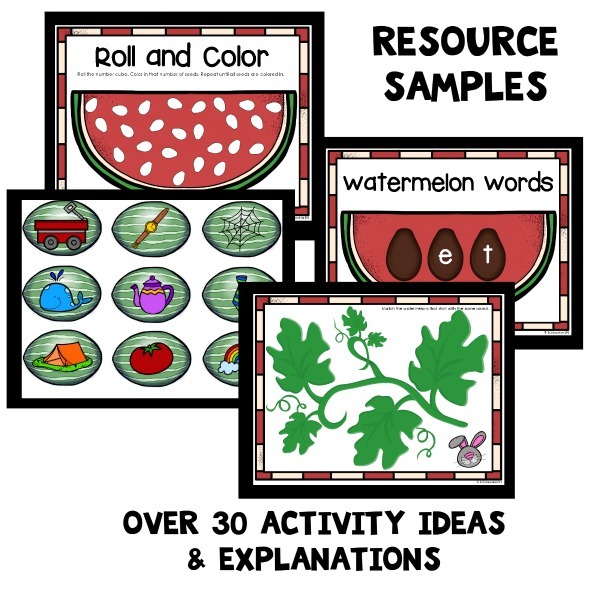 We love incorporating watermelon into our summer fun and learning. And we love eating them even more! Summer is the perfect time of year to read some of our favorite books about watermelon and even have fun creating watermelon art. 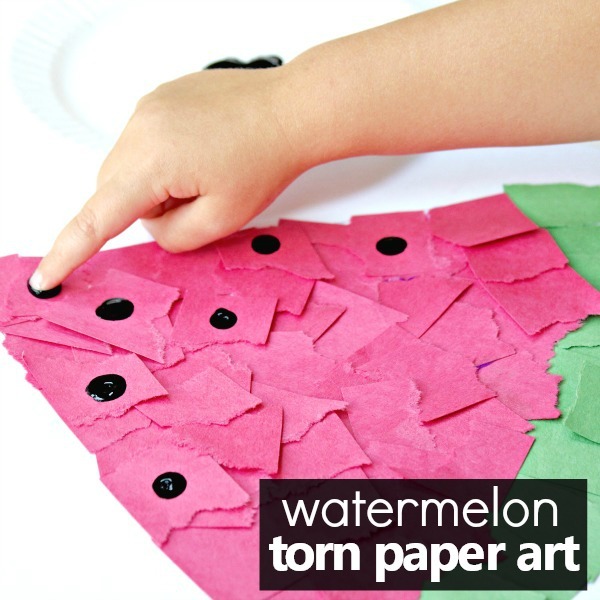 Recently, we created some torn paper watermelon art with just a few simple materials. 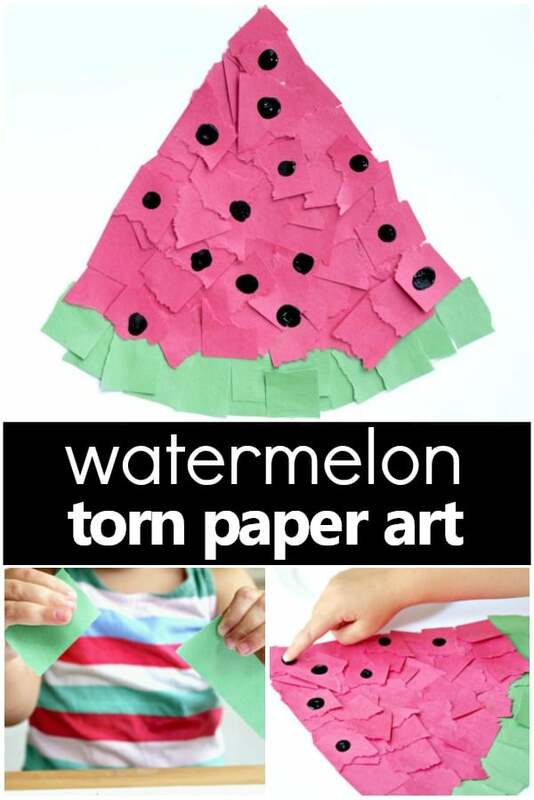 This torn paper watermelon craft is great for little hands as it will strengthen those fine motor muscles. 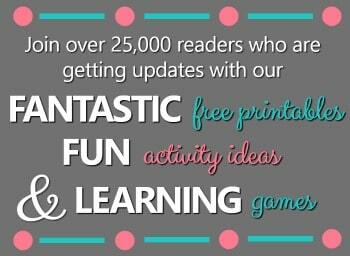 We think you’re going to love to cute fingerprint “seeds” too! Want even more watermelon theme ideas? 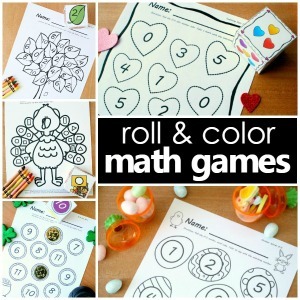 Continue the fun with a full week of watermelon play and learning with our printable lesson plans for home preschool and preschool. 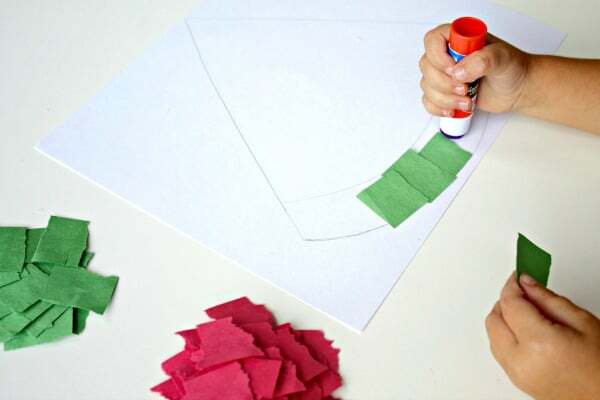 The great thing about this torn paper watermelon craft is that it requires only a little prep and just a few materials. 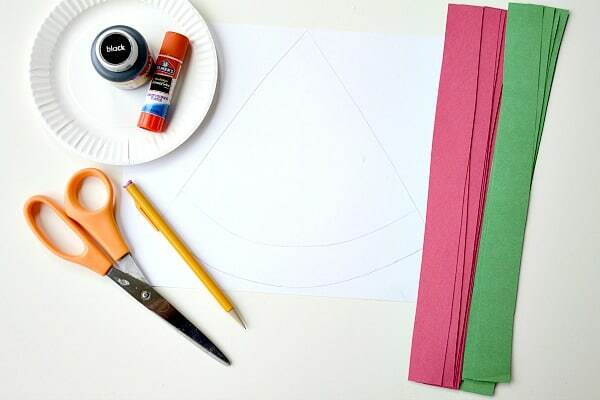 Depending on the age group you are working with, you may choose to cut the construction paper into strips in advance. This will make it easier for tiny fingers to tear squares. Prior to beginning, I also quickly sketched out an outline of a watermelon as a guide. As the art activity was introduced, we took the opportunity to discuss the parts of a watermelon. As we looked over the materials, we talked about what each color of paper and paint would represent. 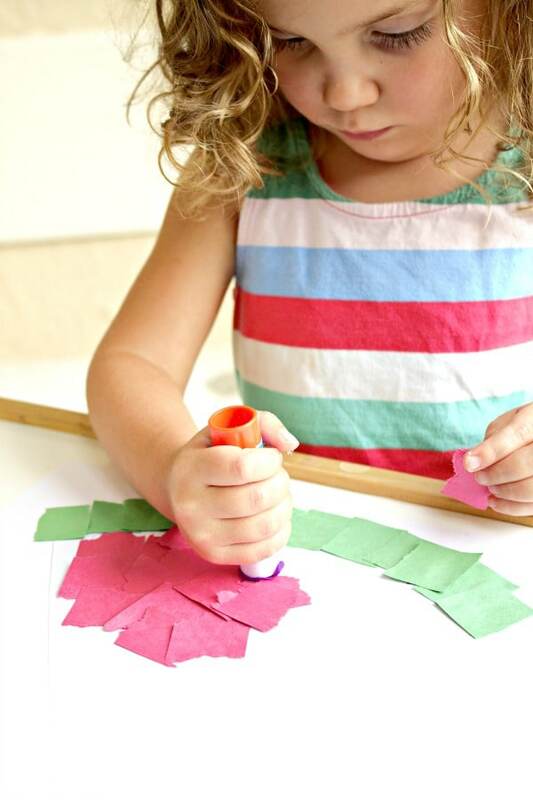 When initially instructed to rip the paper up, our little artist was a bit hesitant-“You want me to rip paper?! 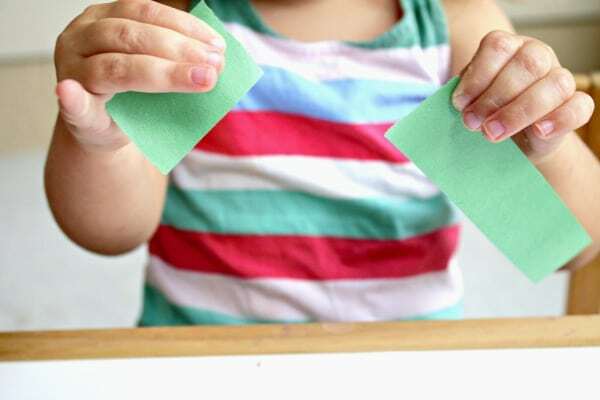 Are you sure?” Once given the green light, she got right to tearing up the red and green strips of paper into small squares. Hearing the paper rip put a smile on her face! Once all the paper was torn, we had a pile of red and green. Now it’s time to create the watermelon! Using a little dab of glue, individual papers were placed onto the watermelon. We began with the green rind first. Little by little the watermelon began to take shape as more red pieces were added. We made sure to cover every lit bit of white as red was layered on. 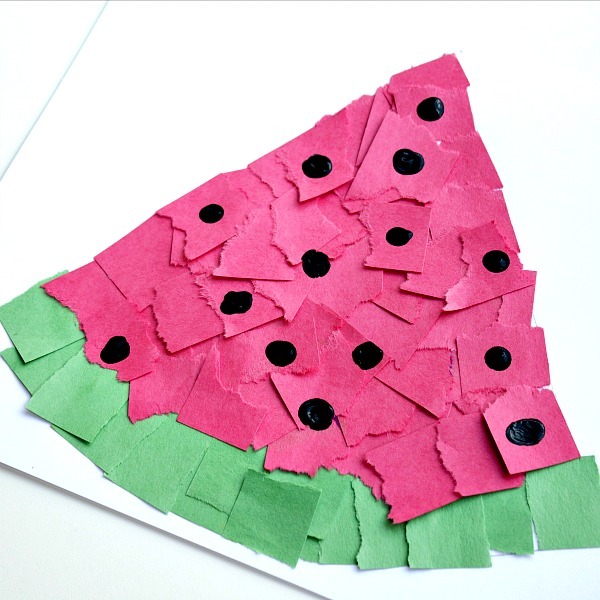 We finished up this fun and hands-on watermelon craft with some fingerprints to represent the seeds. Fingerprints are always a fun way to drop the paintbrushes and create a keepsake at the same time! 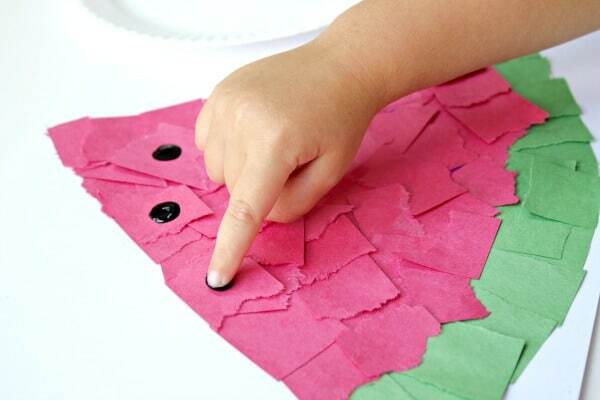 Carefully dipping the index finger into washable black paint, “seeds” were then dabbed all over the watermelon. Feel free to follow up this watermelon craft with a juicy slice of watermelon for yourself. We sure did!